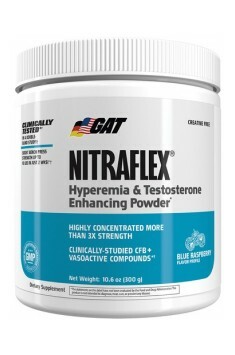 GAT Nitraflex is a technologically advanced pre-workout supplement designed for experienced users. Its ingredients increase focus and endurance to the maximum, enable to achieve monster muscle pump and improve weight training results. In addition, the supplement contains ingredients with scientifically proven beneficial effect on testosterone synthesis. Ingredients boosting nitric oxide synthesis act in synergy, thanks to which effects achieved in the course of supplementation reach beyond your expectations. Free L-arginine, L-arginine alpha-keto-glutarate (AAKG) and L-arginine malate contained in the preparation are excellent sources of the endogenous amino acid, which is of course L-arginine. This substance promotes synthesis of nitric oxide (NO) in the organism, which in turn is a potent vasodilator. This means that it is able to relax musculature surrounding blood vessels, in this way dilating them. This results in increased blood supply to muscle tissue and greater provision of energy substrates, minerals, vitamins and oxygen. As a result, muscles are able to work longer and harder and quickly regenerate after exercise. The mixture also contains L-citrulline and its other form - L-citrulline malate, which compound is a combination of malic acid and L-citrulline molecule. Both of these forms enhance synthesis of nitric oxide very efficiently by increasing the concentration of arginine in the body. In addition, the forms of L-citrulline and L-arginine malate demonstrate higher stability of the molecule in an acidic environment, so they do not break down in contact with hydrochloric acid present in the gastric juice. What is more, malic acid from the above compounds takes part in energy transformation processes in the body. Therefore its increased supply can improve efficiency and ability to generate strength. The above mentioned forms of L-arginine and L-citrulline were supplemented with Resveratrol and its more efficient derivative - Pterostilbene. Apart from high antioxidant potential and anti-inflammatory activity, both of these compounds increase synthesis of the aforementioned nitric oxide. Their addition enhances the muscle pump sensation and supports the circulatory and nervous systems. Beta-alanine is a substrate for the synthesis of carnosine, a substance that maintains the correct pH of muscle tissue. During physical effort, this dipeptide counteracts rapid drops in muscle acidity that occur as a result of the glycolysis process. Increased concentration of lactic acid, which is the reason for the pH drop, gradually reduces the ability to contract muscles, reducing their efficiency. In drastic cases, this process may even prevent further muscle work, leading to nausea and severe pain. Carnosine counteracts drops in the pH level, which increases muscle endurance and reduces soreness during and after training. Caffeine is one of the most popular legal stimulants in the world. It helps keep up high energy levels, improves mood and enables to preform heavy trainings. This is due to the affinity of caffeine to the adenosine receptor in neurons, which reduces inhibitory action of adenosine alone. In this way, neurotransmission occurs faster, which in turn boosts energy and motivation and reduces fatigue. What is more, caffeine accelerates metabolism and may increase exercise capacity of the organism. This effect is due to stimulated secretion of excitatory neurotransmitters, such as adrenaline. DMAE, or Dimethylaminoethanol, is an organic compound with strong nootropic properties, which are due to increased levels of acetylcholine in the brain. Its high concentration allows to focus entirely on the chosen target. It also improves mood. An additional benefit of taking DMAE in connection with its antioxidant properties is the reduction of oxidative stress. Rauwolfia Canescens extract is the source of rauwolscine, a substance that is the α2-adrenoceptor antagonist. Blocking them results in increased noradrenaline secretion, which in turn strongly stimulates, increases exercise capacity and enables to remain focused for a longer time. N-Acetyl-L-tyrosine is the source of L-tyrosine in the acetylated form, which passes the blood-brain barrier more effectively. It can increase the production of dopamine and adrenaline, and therefore has stimulating effect, boosts concentration and improves cognitive abilities. It is also able to increase exercise capacity, which is why it is often used in pre-workout preparations. L-theanine - an amino acid with broad application. Its structure is almost no different from caffeine, but it works quite differently. Depending on the dose, it promotes gentle arousal, but without feeling shaky, or it can have a relaxing and calming effect. It was contained in the supplement to enhance concentration, in this way improving muscle sensation. It is a great addition to strong stimulants because it prevents flight of ideas and supports the ability to concentrate. The product was also enriched with natural, patented form of boron, which is one of the few substances with scientifically documented ability to increase the amount of testosterone in the body of healthy, active people. Most boosters of this hormone increase its level significantly, but only in people with large deficiencies or extremely obese. However, boron increases the amount of free, or biologically active, testosterone by up to 30%, which has been proven in studies on humans. High concentration of this hormone is a key parameter determining the well-being, libido and exercise capacity, both in men and women. In addition, increased testosterone level promotes positive nitrogen balance, which increases the share of anabolic reactions, which in turn boosts muscle development and accelerates regeneration. To sum up, GAT Nitraflex is a comprehensive pre-workout supplement with rich and holistic content, which allows you to complete a spectacular training session even on a hard day. In addition, the product improves mood and can significantly increase the amount of free testosterone. One portion (1 scoop) 30 minutes before a workout. The first day of use must start from the middle of portion (1/2 scoop) to check the tolerance to the product. It is recommended to begin supplementation from 1/2 scoop due to the product’s rich and powerful content. Avoid taking the supplement in the evening, because you may have trouble falling asleep. To boost the muscle pump effect, you can complement this product with glyceryl monostearate. However, be careful, because too strong a muscle pump may prevent you from completing your workout. GERMAN AMERICAN TECH is an experienced manufacturer of supplements for athletes. In their wide product range, among other things, there are protein supplements, weight gainers, carbohydrates supplements, fat reducers and creatine. This brand, as one of the few in the industry, has been awarded certificate of quality cGMP.